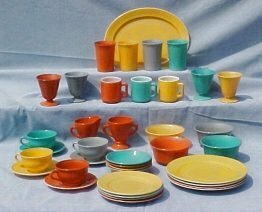 Ovide was the official name Hazel Atlas assigned to their plain dinnerware line. Originally, the dinnerware was made in green transparent (depression glass). After the introduction of Platonite in the mid 1930s, Hazel Atlas produced a variety of color schemes using the Ovide blanks. Some pieces in Ovide are found with advertising from ice cream parlors, businesses, dairies and an occasional restaurant. The ovide style was also used for all the spacemen, childrens, and Ranger Joe sets. The above set is in the Tempo color scheme. Notice the mugs? This is one of the few sets that had mugs available. Collectors and decorators like assembling the sets in a variety of colors. 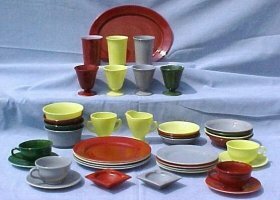 Overall there is no 'rare' color in the ovide and a variety of all colors make an interesting place setting. Names were assigned to the color schemes, however the blank is called ovide, while the color scheme determined the pattern name.